AleaSoft, March 19, 2019. AleaSoft analyses the reintroduction of the 7% tax on the generation of electricity and its impact on the price of the Iberian electricity market MIBEL. Since the Minister for the Ecological Transition, Teresa Ribera, announced that the suspension of the Tax on the Production Value of Electric Power (IVPEE, its acronym in Spanish), better known as the 7% tax on electricity generation, will not be extended, several news on rising electricity bills from the month of April have appeared. But let’s go step by step. The electricity bill will not increase because a new tax is now included. 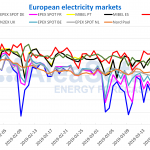 The expected rise in price comes indirectly from the expected increase in the price of the Iberian Electricity Market MIBEL, to which the Voluntary Price for the Small Consumer (PVPC, its acronym in Spanish) is indexed. And the logic applied is quite simple: if the producers have to pay a 7% tax that until now they did not have to pay, then they will increase the price of their offers in the wholesale market by 7% in order to have the same profitability, and consequently the market price will increase by 7%. And that would mean a rise between 3% and 4% in the domestic electricity bill. But reality and the electricity market are far more complex than that simple logic. On the one hand, not all producers will increase the price of their offers in the market by 7%. Those producers who can manage their production could do so: gas combined cycles, coal-fired thermal power plants and hydroelectric dams, mainly. But not those technologies that cannot store and manage their resource, mainly renewable energy: wind, solar photovoltaic, solar thermal, run-of-river hydropower, etc. So, at least, the price increase will not occur in all the hours of the day. And, on the other hand, if producers place more expensive offers in the market, they will be less competitive compared to other producers in France or Portugal, where the tax does not exist and, therefore, they do not need to apply a price increase to their offers. So, if the price tends to rise because the offers in the Spanish market are more expensive, imports from Portugal and France increase and the price remains at the same level. Obviously, the interconnections have a limited capacity, but again we see how the price can no longer rise as much as the simple logic pointed. However, as explained by AleaSoft, it is logical to think that, if the electricity production cost increases, the market price will also increase. This is indeed the case, and it is an important aspect that the consultancy includes in its price forecasting models. AleaSoft‘s forecasts indicate that at the short-term the price increase could be between 2% and 5% at most in some hours compared to the market price without the reimplantation of the tax, but in the mid-term, throughout the months of April and May, the effect would vanish. All these are estimations under normal conditions, because there are many factors that influence the market price and phenomena such as wind or rain storms or cold snaps can make that price increase indiscernible. These estimations from AleaSoft are with respect to the price that the market would have if the tax were not applied again. 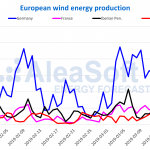 In fact, the seasonal increase in solar energy production, or an increase in wind energy or hydroelectric production, together with the fall in electricity demand due to the increase in temperatures in spring, could lead to a drop in the price of the Iberian market in April compared to March. An analysis of the impact of a measure of this type is very complex. According to AleaSoft, specialized in electricity markets analyses, to evaluate a posteriori what has been the effect on the market price of the reintroduction of the IVPEE is going to be complicated. On the one hand, as already mentioned, because it is easy for its effect to be masked by the evolution of external conditions that affect the market price. And, on the other hand, because it is very interpretable to establish how the market agents would have acted if the suspension of the tax had continued in place. Already at the time of the suspension of the tax it was difficult to determine the impact of the measure on the market price. The tax was suspended in October 2018 with the publication of Royal Decree-Law 15/2018, of October 5, together with other measures such as the exemption of the green cent, with the intention of lowering the price of the electricity bill. At that time, the electricity market had ended the month of September with an average price of 71.27 €/MWh, the second most expensive month of September in the history of the market, just after September 2008. Had the suspension of the tax got an impact? Looking only at the evolution of the electricity market price, it is clear that, after applying the suspension, the price started to fall, and since then it has not reached that level again. 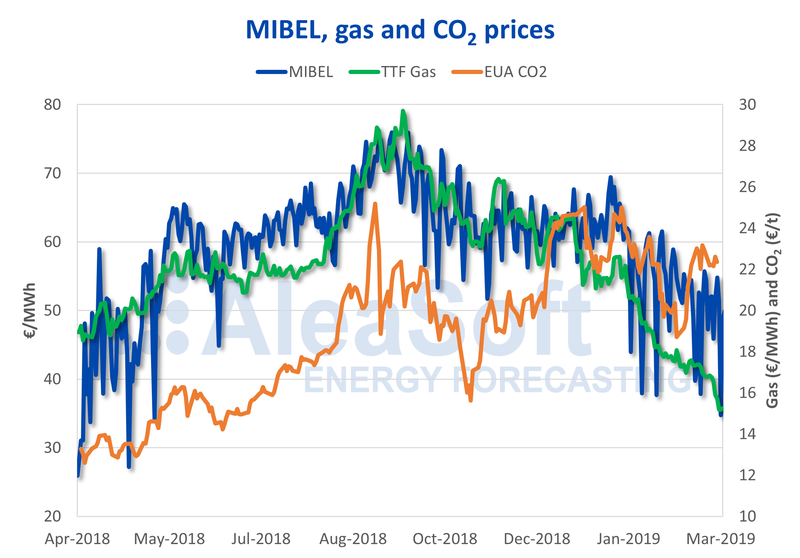 Although part of this stop of the upward race of the price that started in March 2018 can be attributed to the impact of the Royal Decree-Law, according to AleaSoft the fall in the price of gas and coal fuels and of CO2 emission rights were the key elements of the price drop. Source: Prepared by AleaSoft using data from OMIE, EEX and PEGAS. In that time of maximum prices in the electricity market, by the end of September 2018, gas, coal and CO2 prices were also at maximum levels. The EUA spot price of CO2 in the EEX market set its maximum price on September 10 at 25.19 €/t, and since then it has not returned to that value. This week the price is oscillating around 22 €/t. For its part, the spot price of TTF gas in the PEGAS market recorded its last maximum value on September 25 at 29.69 €/MWh, and since then its price has not stopped falling. This week it continues to fall and has already broken the barrier of 15 €/MWh. Also, the front month future of API 2 coal exceeded 100 $/t in the ICE market in September. After the suspension of the tax, it was estimated in AleaSoft that in the short-term the application of all the measures of the Royal Decree had meant a fall in the price between 5% and 6%. But in the mid-term, the decline and the stabilization of the market price have been mainly due to the evolution of the prices of the fuels and the CO2 emissions rights.